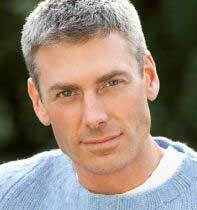 ← Lipovingual Liquid – alternative to lipotropic injections. Shipping: Worldwide including Australia, Canada, USA, UK, Ireland, Europe. 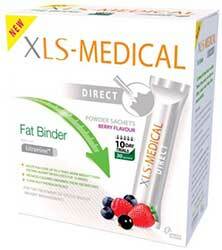 XLS Medical Direct is a fat binding supplement made in Europe by Omega Pharma. It is produced in powder form and packed into one-dose sachets that can be carried around easily in a pocket or purse. Supplement powders usually have to be mixed with water before they are consumed, but XLS Medical Direct is somewhat unusual in that it is designed to dissolve in the mouth. No water is required, so it is more convenient to use than tablets or capsules and may prove to be a good option for anyone who has difficulty swallowing pill-type supplements. Fat binders contain indigestible ingredients that have the ability to absorb fat. When the fat is absorbed it becomes indigestible as well and the mass formed by the fat binder and bound fat passes through the body, without releasing any calories, and exits the body as faecal matter. However, potential users need to be aware the use of fat binders usually results in softer, oilier stools. Each gram of fat that is consumed contains nine calories, so if XLS Medical Direct really can bind up to 28% of dietary fats the results should be good, and the fat binding process can also help protect against the damaging effects of cholesterol. As an added bonus, the combined presence of the fat binder and the bound fat inside the stomach can also create a feeling of satiety that results in a suppressed appetite. Usage Guidelines – Three sachets are required each day and each one-dose sachet should be taken just after eating a meal, with the most viable times probably being breakfast, lunch, and dinner. The powder should be poured into the mouth and then swallowed after it has mixed with the saliva. XLS Medical Direct usage should be continued for at least a month. XLS Medical Direct contains a proprietary blend called Litramine. The main ingredient in Litramine is opuntia ficus-indica (often called Prickly Pear) that is derived from a species of cactus. The blend also contains a few additional soluble fibres to help encourage ease of absorption. Hundreds of years ago Indian tribesmen used to chew on opuntia ficus-indica to suppress their appetites while they were out hunting. Its fat binding abilities are a more recent discovery. The January 2013 issue of Obesity featured the results of a study that appears to support Litramine’s abilities as a weight loss provider. The researchers recruited 125 obese adults. Some of them were given Litramine, others received a placebo. The study ran for a period of 12 weeks, during which time two of the volunteers dropped out. The data gathered at the completion of the study revealed the volunteers that had received Litramine had lost at least 5% of their initial body weight (compared to the placebo group). The researchers agreed the results indicated Litramine is effective for providing weight loss. XLS Medical Direct is a gluten and lactose-free supplement that is suitable for vegetarian use. 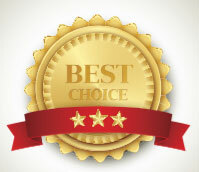 The volunteers who took part in scientific trials did not report any negative issues, and the existing customer feedback does not suggest side effects are likely. However, pregnant or nursing mothers should consult a doctor before using weight loss supplements of any kind. The same advice is offered to people who have existing health problems or are taking medication. Anyone who wishes to purchase a supply of XLS Medical Direct should find it reasonably easy to find a supplier. It is a stock item at many chemists’ stores and is also available from a number of reputable online suppliers including Pharmacy 4 Less and Chemist Warehouse. Each pack contains 90 sachets and prices usually range from around $65 – $80, depending on the supplier. However, only one flavour option is available and there is no money back guarantee. 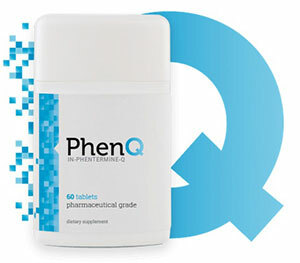 As mentioned above we prefer the capsule based PhenQ – in our opinion it offers dieters not only the fat binding / fat blocker mechanic of action but also fat burning and appetite suppression.